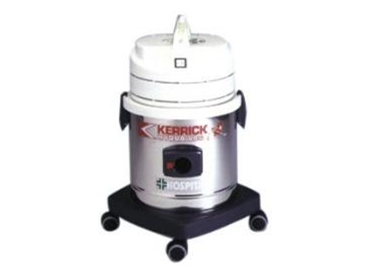 The Hospital Vac from Kerrick Industrial Equipment is a high filtration vacuum cleaner, specifically designed for hospital use. It is a low noise unit with high performance in cleaning. Hospitals require a clean, dust-free environment. An effective, efficient vacuum cleaner can help reduce health problems faced by patients suffering from asthma, hayfever and allergies. The Hospital vac is such a vacuum cleaner. As such, this vacuum cleaner is ideal for hospitals, nursing homes, laboratories and research establishments. Hospital Vac vacuum cleaner’s three stage filtration comprises filters of polyester, moltroprene and Hepa elements. This unique three stage filtration system traps 99.95 % of the mass producing dust and airborne germs.